The story began in a land far, far away, with a little girl listening to a bedtime story. "My name is Hala and I live in Yemen with my brothers, Mohammed and Anas, our mother, storyteller Leena Jamil, and our father, artist Abdulla al-Ameen. We liked one of Mum's stories, The Enchanted Lake, so much that we asked her to write it down and we asked Dad to illustrate it for us." And that's exactly what happened. Leena wrote down her modern-day folk tale - in Arabic of course - and Abdulla created a beautiful painting of a middle-eastern townscape, showing key characters and events from the story. When Pat Aithie, the Cardiff artist and photographer, saw Abdulla's painting, she was determined to find a wider audience for the story. Pat, a leading member of the British-Yemeni Society, was already familiar with Abdulla's reputation as an artist and eager to promote the work of this highly-regarded painter, who had already visited Wales on a study tour. The Arabic story become two picture books, one in English, one in Welsh. Pat contacted Pont Books, part of Gomer Press in Llandysul, where the editor became excited about the potential for a book linking Wales and Yemen. Pont has close links with schools and colleges in Wales, and the editor could see that a beautifully illustrated story book would be a wonderful way of promoting multi-cultural understanding. But as it would be a ground-breaking publication, it would need the support of other organisations. Yemen and Wales have a long shared history. In the 19th century, Yemen, sometimes called "the bread basket of Arabia" because of its fertile soil and favourable growing climate, played an important role in the Welsh coal trade. When ships from Britain sailed all over the world, Yemen became important as a place to refuel, because the deep and sheltered port of Aden was ideal as a centre for storing coal. As one of the most important coal-exporting ports in the world, Cardiff sent coal ships out to Yemen. Yemeni seamen, capable of working in intense heat, were employed as stokers in the ships' engine rooms, describing Welsh coal as "the best in the world". Some decided to settle in Cardiff and so the Yemeni community began to put down roots. Today the community is a vibrant one, making a rich contribution to Cardiff's cosmopolitan cultural and artistic identity. Meanwhile, a number of bodies - the British-Yemeni Society, ARUP (the international organisation specialising in building and engineering projects), Arts & Business Cymru and the Prince of Wales Arts & Kids Foundation - agreed to support the enterprise and Gomer staff began the process of developing an exciting and eye-catching picture book which would appeal to the children of Wales. The story has the feel of a traditional folk tale: a father tells his children to behave while he is away on pilgrimage; they know that they should not swim in the enchanted lake but boys are boys all over the world and Sa'ad breaks the rules. When he is turned into a gazelle - a striking parallel with stories in the Welsh folk tradition - the only remedy is to pay a perilous visit to the King of the Seas. Sa'ad's sister, Afnan, feels very guilty - the only reason Sa'ad went back to the lake was because she had left her comb behind - and, although she is desperate to see her father again, she isn't looking forward to having to tell him about her brother's transformation! As this is a children's story, a happy ending isn't altogether unexpected, but readers will be intrigued to discover just how all the loose ends are finally tied. Of course, a picture book doesn't work without pictures and fortunately Abdulla was happy to produce a whole new series of illustrations, while details from his original story painting can be seen on the book's endpapers. The editors at Pont have also included an information section about the shared history between Wales and Yemen. Gomer Press wanted the story to reach as many readers as possible and so Helen Emanuel Davies was commissioned to translate The Enchanted Lake into Welsh Y Llyn Hud. 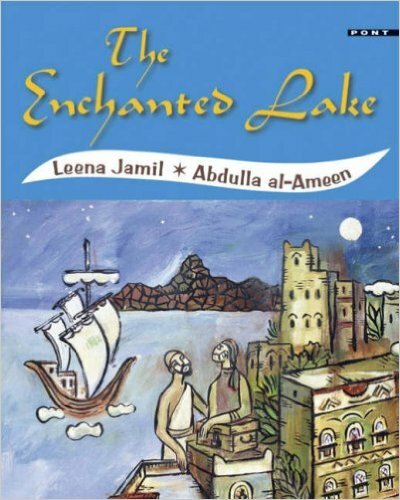 The Enchanted Lake by Leena Jamil and Abdulla al-Ameen, Pont Books, £5.99. Y Llyn Hud (addasiad gan Helen Emanuel Davies), Gomer, £5.99. The books are available from bookshops, or directly from Gomer Press, Llandysul. Call 01559 363 092.